The internet, she is a harsh mistress. When I decided to start this blog, I got hung up on the name. Names always trip me up; I never know what to name anything. My daughter is lucky her diploma does not say “Baby Girl Beaty.” I can easily write pages of witty and snappy dialogue only to screech to a halt when my characters have to call each other by name. And so I sweated and stewed over the name for this blog. I had a feel for what the name should be, but no words for that name. Once at 2 am woke up with a brilliant idea, only to ever so gently have it criticized by those I love. So I went back to stewing. Luckily, the years I have put in stewing over just the right name, or word, or plot point or solution to a problem have taught me to trust the process, or to put it in a less Midwestern way, to trust myself. I know that eventually an answer will come if I live with the irritation and unease of the question long enough. I don’t always trust that knowledge, but more and more I silence the voice that tells me I have had my last good idea. Image courtesy of Michael Grab, Gravity Glue. Eventually, I arrived at Ebenezer Stones. There is something about stones. They are both foundation and hindrance. We can stack them to great heights, but we need to pull them from the ground first. Like many people, I am drawn to them. I have jars of agates in my home and hunks of quartz the size of my fist. 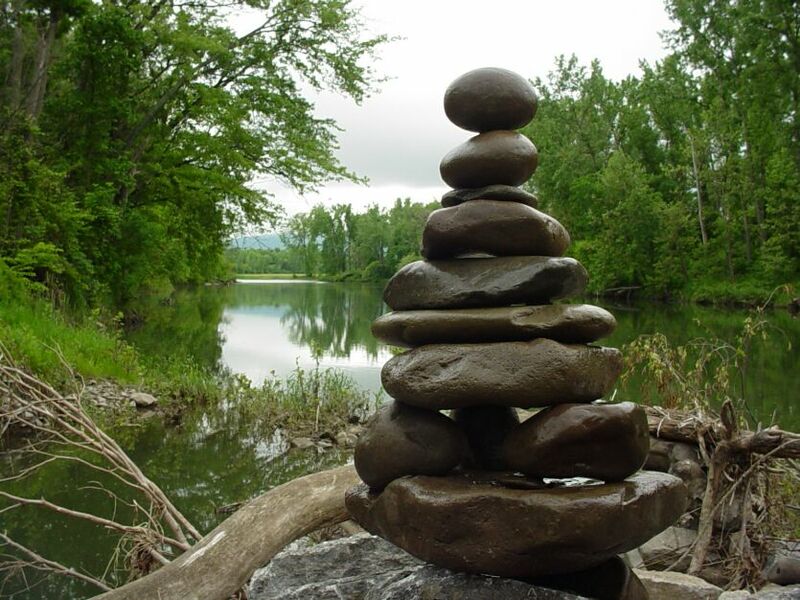 My favorite meditation is to sit on the shores of Lake Superior and toss rocks into the water for hours on end. And the word nerd side of me loved using a word most people associate with movie versions of a Victorian novel. Few people know what the word really means. The word Ebenezer comes from Hebrew and means “stone of help.” The story goes that after the Israelites defeated one of their many enemies (this time the Philistines) Samuel took a stone, set it as a monument and named it Ebenezer. “Thus far the Lord has helped us,” he is reported to have said, although probably not in the King’s English. So, Ebenezers can be a reminder of a turning point, a marker of a battle won, or a struggle survived with the help from something bigger and vaster and wiser than we are. Call it God, or providence or Higher Power. There comes a time when we learn the limits of what we can do by ourselves. When that time comes, we need reminders of the help that has been there in the past and will be there again. Ebenezer stones call us, like Scrooge, back to our better selves. Ebenezer Stones. The perfect name for what I want to do here. The fickle, fickle internet, she had other plans. EbenezerStones.com was taken, as was EbenezerStone (which I truly hope was registered by a young bookish man named Eb Stone). After a little grieving for my brilliant idea, I moved on. Who needs “stones” anyway? It’s right there in “Ebenezer.” “Ebenezer stones” is like La Brea Tar Pits or ATM machine. It would make me look foolish in front of all the other nerd words. What this blog title needed was a verb! Words matter, so I rolled all sorts of verbs about in my head. Each one changed the point of the the blog just a bit. “Placing” was too passive. “Creating” was too active. “Raising” was taken. Finding, laying, stacking, all right out. I stopped myself from grabbing a thesaurus and went simple and plain. Building. Building Ebenezers. We can create reminders of where our help comes from. We follow the paths paved by fellow wanderers, learning from their trials. We can place markers for those who come after us, sharing our stories — the ones that seemed to end in failure as well as the ones that look like success. We can carry these Ebenezers with us: photos, meaningful pieces of jewelry, sobriety coins, little polished worry stones, tattoos, scars – both seen and unseen. We all have felt we are lost, wandering in the wilderness. We know the feeling of standing alone before a powerful enemy. So much in this life isolates us. When we turn to each other and share our stories, we remember where our help has come from, and we trust it will come from there again. 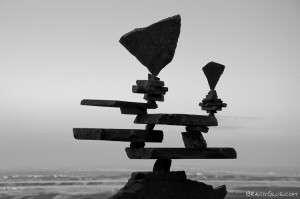 The images of balanced rocks on this page and in the header are provided courtesy of Michael Grab. 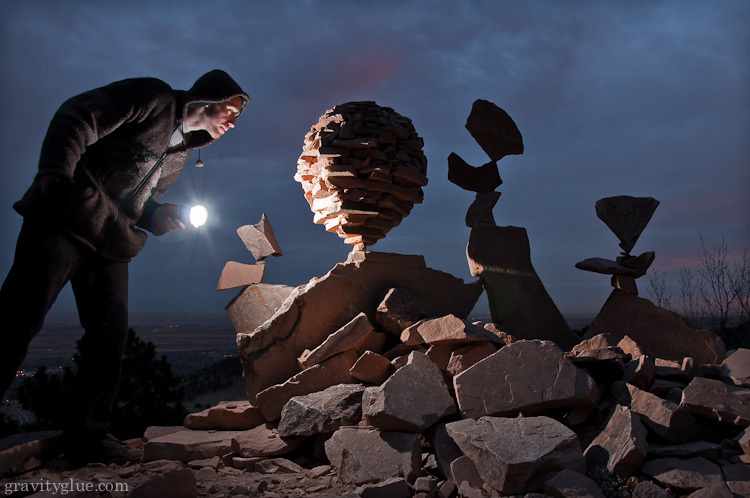 Michael’s amazing rock balancing work can be seen at his website, Gravity Glue. I was first drawn to Michael’s images a few years ago. They never fail to inspire me and still my soul. I am grateful to Michael for his art and his generosity. Michael retains the copyright for these images. Please contact him for more information. Hi, Beth. I love the story of how you came to calling this blog “Building Ebenezers.” So lovely and so appropriate. Sallee! How wonderful to hear from you! Things are good for me here. I hope they are with you, too. I’m so glad you are reading and like the reason for the name of blog. That means a lot!